Japan has at long last officially recognized the World Boxing Organization alongside the World Boxing Council and the World Boxing Association. The recognition comes after a determined effort by the WBO to gain the confidence of the Japan Boxing Commission. WBO president Francisco “Paco” Valcarcel who is in Japan along with the head of the WBO Asia-Pacific region Leon Panoncillo who has done much to expand the presence of the WBO in the region thanked businessman-sportsman Akihiko Honda who owns Teiken Promotions and the famous Teiken Gym as well as promoter Felix “Tutico” Zabala for their hard work over the past three years to ultimately gain the recognition in Japan. Valcarcel together with the Japan Boxing Commission will officially announce the entrance of the WBO to Japan at a news conference at the Tokyo Dome Hotel at 2:00 p.m. on Monday. Also in the delegation of Valcarcel is WBO Ratings Chairman Luis Perez. The Philippines has played a prominent role in the WBO and currently has three world champions led by super bantamweight champion Nonito “The Filipino Flash” Donaire, light flyweight champion Donnie Nietes and flyweight champion Brian Viloria who is also holder of the WBA belt after scoring a spectacular 10th round TKO over Mexico’s Hernan “Tyson” Marquez last November. The only other Filipino world champion is light flyweight Johnreil Casimero who holds the IBF belt. 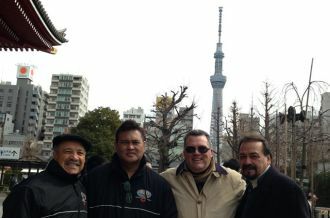 Photo (L-R) WBO President Francisco 'Paco' Valcarcel, WBO Vice-President for Asia-Pacific Leon Panoncillo, Felix 'Tutico' Zabala and WBO Ratings Chairman Luis Perez invade Japan.